Prime Minister Manmohan Singh was today briefed on India’s assessment of the military prowess of its neighbours and the level of its military readiness to face China and Pakistan. 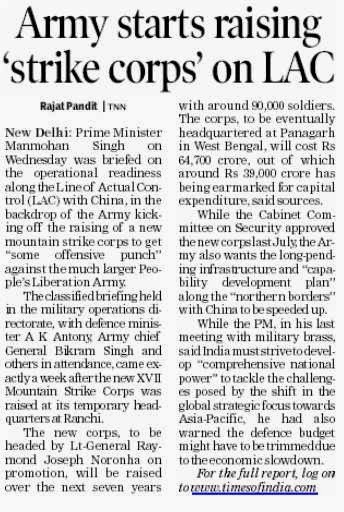 The PM was also informed about what all needed to be done to ramp up Indian facilities, equipment and the raising of the newly approved mountain strike corps. The PM had walked into the military operations room, also known as the “war room”, today morning. It is from this room that all military tactics are decided and executed on a day-to-day basis. The room located in the “sanitised” office of Director General Military Operations (DGMO) Lt Gen Vinod Bhatia is scanned for snooping devices and is the most secure facility in South Block where the PM’s office is located and so is the Defence Ministry. According to sources, the PM addresses the top tri-services brass at the Combined Commanders' Conference annually, but rarely comes to the Army Headquarters for such briefings. At the briefing, the PM was joined by Defence Minister AK Antony and Chief of Indian Army General Bikram Singh. Though the military establishment was tight-lipped over the content of the briefing and its agenda, sources said such briefings had happened in the past but with no fixed periodicity. 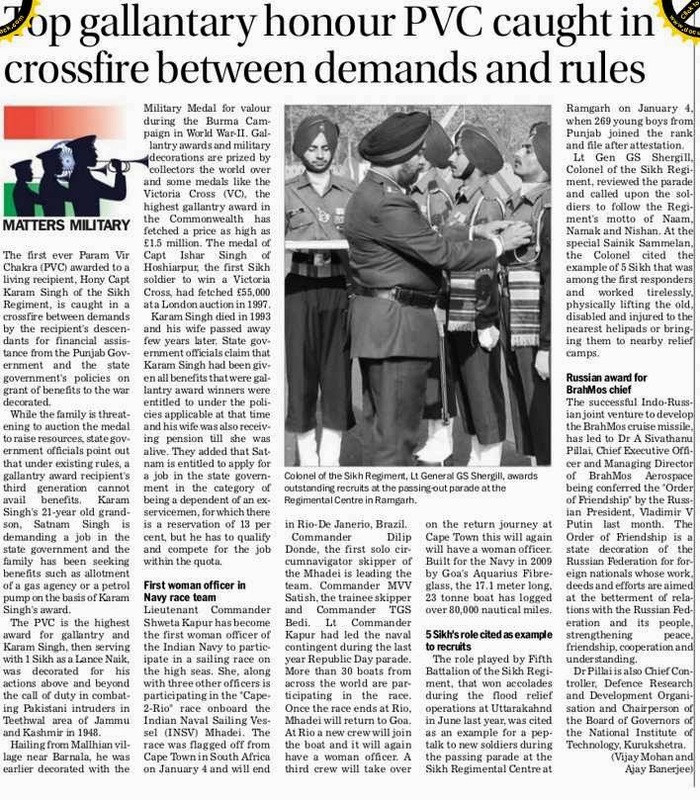 “Matters which the Army believes are important must have been discussed and flagged to the PM,” a senior functionary said. The armed forces said they feared a spill over from Afghanistan once the forces start pulling out from the country in June this year. 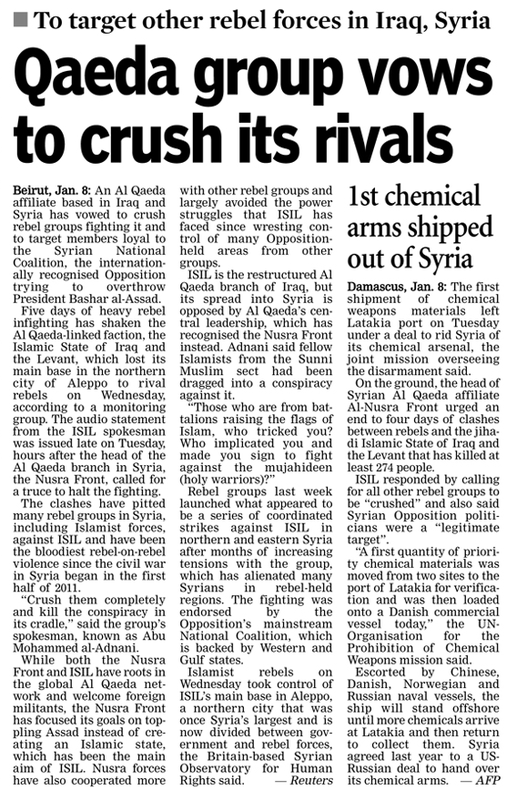 It is feared that terror elements would spread in the region, creating problems for countries such as India. The first ever Param Vir Chakra (PVC) awarded to a living recipient, Hony Capt Karam Singh of the Sikh Regiment, is caught in a crossfire between demands by the recipient's descendants for financial assistance from the Punjab Government and the state government's policies on grant of benefits to the war decorated. While the family is threatening to auction the medal to raise resources, state government officials point out that under existing rules, a gallantry award recipient's third generation cannot avail benefits. Karam Singh's 21-year old grandson, Satnam Singh is demanding a job in the state government and the family has been seeking benefits such as allotment of a gas agency or a petrol pump on the basis of Karam Singh's award. The PVC is the highest award for gallantry and Karam Singh, then serving with 1 Sikh as a Lance Naik, was decorated for his actions above and beyond the call of duty in combating Pakistani intruders in Teethwal area of Jammu and Kashmir in 1948. Hailing from Mallhian village near Barnala, he was earlier decorated with the Military Medal for valour during the Burma Campaign in World War-II. Gallantry awards and military decorations are prized by collectors the world over and some medals like the Victoria Cross (VC), the highest gallantry award in the Commonwealth has fetched a price as high as £1.5 million. The medal of Capt Ishar Singh of Hoshiarpur, the first Sikh soldier to win a Victoria Cross, had fetched £55,000 at a London auction in 1997. Karam Singh died in 1993 and his wife passed away few years later. State government officials claim that Karam Singh had been given all benefits that were gallantry award winners were entitled to under the policies applicable at that time and his wife was also receiving pension till she was alive. They added that Satnam is entitled to apply for a job in the state government in the category of being a dependent of an ex-servicemen, for which there is a reservation of 13 per cent, but he has to qualify and compete for the job within the quota. Lieutenant Commander Shweta Kapur has become the first woman officer of the Indian Navy to participate in a sailing race on the high seas. She, along with three other officers is participating in the "Cape-2-Rio" race onboard the Indian Naval Sailing Vessel (INSV) Mhadei. The race was flagged off from Cape Town in South Africa on January 4 and will end in Rio-De Janerio, Brazil. Commander Dilip Donde, the first solo circumnavigator skipper of the Mhadei is leading the team. Commander MVV Satish, the trainee skipper and Commander TGS Bedi. Lt Commander Kapur had led the naval contingent during the last year Republic Day parade. More than 30 boats from across the world are participating in the race. Once the race ends at Rio, Mhadei will return to Goa. At Rio a new crew will join the boat and it will again have a woman officer. A third crew will take over on the return journey at Cape Town this will again will have a woman officer. Built for the Navy in 2009 by Goa's Aquarius Fibreglass, the 17.1 meter long, 23 tonne boat has logged over 80,000 nautical miles. The role played by Fifth Battalion of the Sikh Regiment, that won accolades during the flood relief operations at Uttarakahnd in June last year, was cited as an example for a pep-talk to new soldiers during the passing parade at the Sikh Regimental Centre at Ramgarh on January 4, when 269 young boys from Punjab joined the rank and file after attestation. Lt Gen GS Shergill, Colonel of the Sikh Regiment, reviewed the parade and called upon the soldiers to follow the Regiment's motto of Naam, Namak and Nishan. At the special Sainik Sammelan, the Colonel cited the example of 5 Sikh that was among the first responders and worked tirelessly, physically lifting the old, disabled and injured to the nearest helipads or bringing them to nearby relief camps. The successful Indo-Russian joint venture to develop the BrahMos cruise missile, has led to Dr A Sivathanu Pillai, Chief Executive Officer and Managing Director of BrahMos Aerospace being conferred the "Order of Friendship" by the Russian President, Vladimir V Putin last month. The Order of Friendship is a state decoration of the Russian Federation for foreign nationals whose work, deeds and efforts are aimed at the betterment of relations with the Russian Federation and its people, strengthening peace, friendship, cooperation and understanding. Dr Pillai is also Chief Controller, Defence Research and Development Organisation and Chairperson of the Board of Governors of the National Institute of Technology, Kurukshetra. “The Indus Waters Treaty (IWT) was a great achievement of Pakistan and India and of the World Bank, and it remains so… and these proceedings are an illustration of its continuing vitality," said Judge Stephen M Schwebel, chairman of the seven-member Court of Arbitration (CoA) in the Indus Waters Kishenganga Arbitration that delivered the final award on December 20, 2013. The court, based at the Permanent Court of Arbitration, The Hague, has adjudicated upon the dispute concerning the Kishenganga Hydroelectric Project (KHEP) raised by Pakistan. It has conceded that the right of India to divert waters from the Kishenganga (called Neelum in Pakistan) for power generation is protected by the 1960 IWT. However, it added a caveat that this right is not absolute and India is under an obligation to maintain the minimum flow to be released downstream from the KHEP dam at 9 cumecs. The court has not accepted India's argument for the usage of the drawdown technique for flushing sediment accumulated in the reservoir except in the case of “unforeseen emergency”. The award is a landmark for legal governance of shared trans-boundary water resources. The dispute has raised important questions on the relevance of the IWT; model of development adopted by building large dams and reservoirs for hydro-electric power with environmental consequences; application of international environmental obligations and adequacy of existing international courts; and tribunals to settle complex water disputes. Despite the history of animosity, trust deficit and inhospitable hydro-political climate, India and Pakistan remained engaged in the trans-boundary Indus Basin water-sharing cooperative framework through the IWT. The treaty regime has survived wars, shrill calls for abrogation, political instability and helped, to some extent, in containing water disagreements. It has also served as an important function of allocation of river waters as well as providing an inbuilt framework for the settlement of disputes. The Baglihar Dam case, referred to the neutral expert, was a testimony of its effectiveness and resilience. The Kishenganga case marks the first instance in the history of the IWT when a CoA was constituted. The proceedings have arisen out of a dispute concerning the implementation of the treaty in relation to the construction and operation of the KHEP. The primary subject of the arbitration was the KHEP, currently under construction by India on the Kishenganga, a tributary of the Jhelum. The KHEP is designed to generate power by diverting water from a dam site on the Kishenganga (within Gurez Valley, an area of higher elevation) to the Bonar Nullah, another tributary of the Jhelum (lower in elevation and located near Wullar Lake) through a system of tunnels, with moving water powering turbines having a capacity of 330 MW. For the management of sedimentation in the reservoir, India intended to employ the technique of drawdown flushing that consists of drawing the water in the reservoir down to a level close to that of the riverbed by releasing water through low-level outlets in the dam. These were the issues raised by Pakistan. In view of the technical nature of the dispute, the court visited project sites at Neelum-Jhelum and Kishenganga. It highlights difficulties surrounding the technical nature of the disputes and perceived lack of expertise for the adjudication of such projects having environmental consequences. It heard the matter in 2012 and gave a partial award on February 18, 2013. The partial award provided that India may divert water from the Kishenganga for power generation and deliver the water released below the power station into the Bonar Nullah. The issues of India's obligation to maintain a minimum flow of water in the Kishenganga; and usage of drawdown flushing to an extent that would entail depletion of the reservoir below dead storage level (portion of storage not used for operational purposes) became highly contentious during the proceedings. The court decided to do a tightrope walk to ensure the balance of interest for both parties. It conceded priority right to India since it crystallised KHEP before Pakistan resorted to the NJHEP. Still such a right to develop a hydroelectric project has been sought to be circumscribed by ensuring a minimum flow in the river and rejection of the drawdown flushing technique. The moratorium issued in the award would be applicable to all future run-of-the-river projects to be carried out by India, sowing seeds of potential difference. The court analysed the data with regard to the impacts of a range of minimum flows to be discharged at the KHEP dam. It decided "a minimum flow criterion of 9 cumecs at KHEP is a relatively severe criterion with respect to environmental flow, but would nevertheless be sufficient to maintain the natural flows". It has recognised that a degree of uncertainty is inherent in any attempt to predict environmental implications such as the flows in the Kishenganga. In its view, the appropriate mechanism for the reconsideration of minimum flow, exchange of data and monitoring of the parties' usage on tributaries of the Indus is the Permanent Indus Commission (PIC). The ball is back into the court of the IWT mechanism of PIC. That brings under scanner the efficacy of the IWT in resolving disputes. The final verdict vindicates the obligation for peaceful settlement of disputes enshrined under the UN Charter. 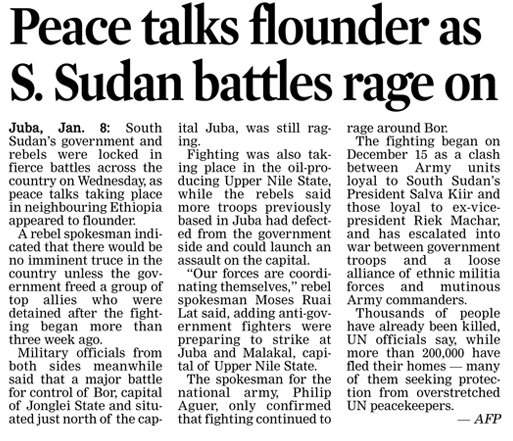 However, the growing number of disputes arising under the IWT underscores distrust between the parties. Ironically, Pakistan's invoking of the IWT mechanism shows its inability to resolve bilateral disputes through negotiations and ineffectiveness of PIC that led the matter to highly expensive international arbitration proceedings even as both countries are facing extreme poverty. It raises a question on the working of PIC to resolve disagreement. Some perceived challenges could arise due to the pressure of population and developmental needs as well as shrinking water availability in the Indus Basin due to a host of factors including climate-induced changes. But it does not affect the utility and effectiveness of the IWT as it provides multiple methods to resolve issues. It is time to use cutting-edge technologies and hardware such as remote sensing satellites and geographical information systems that play a vital role in the planning, construction and maintenance of such projects. It could help in jettisoning rumours, ignorance and emotions from taking hold in the absence of hard data. 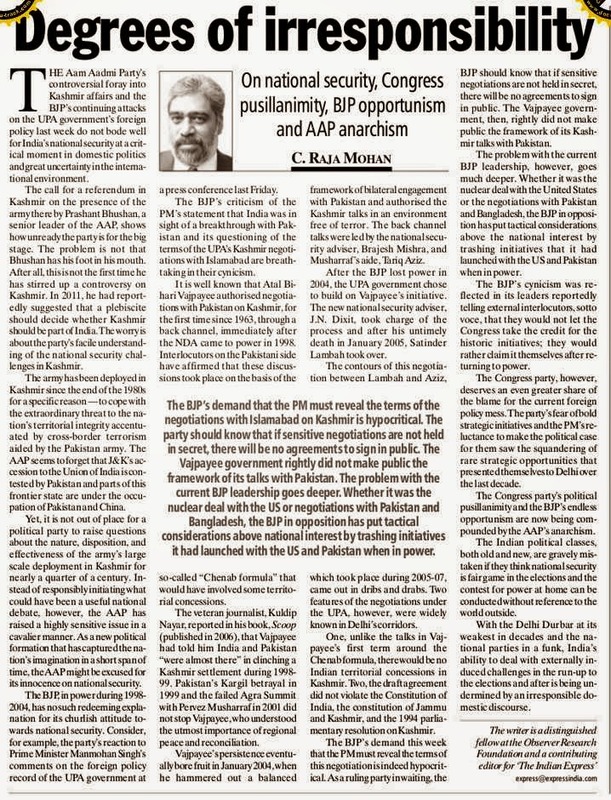 The fact that parties have turned, time and again, to the IWT mechanisms - and not the use of force - itself speaks volumes for the existing legal governance of Indus waters under the treaty. 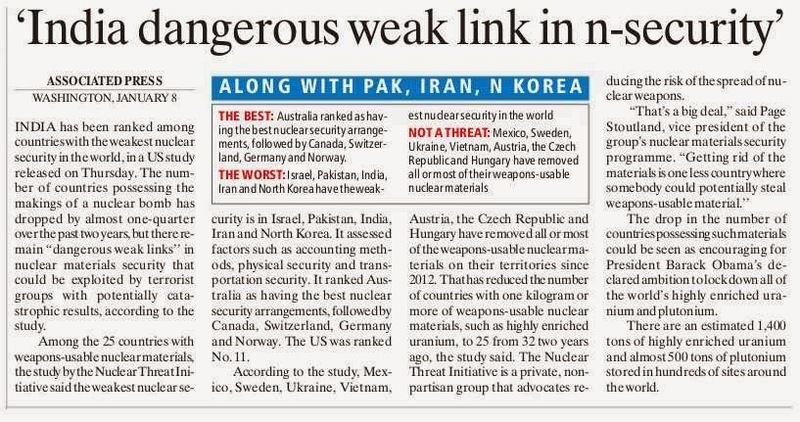 However, complaints by Pakistan that India is violating the IWT and its efforts to drag the matter to an international forum emanates from deeply entrenched distrust and compulsions of domestic politics. The IWT has withstood the test of time in showcasing the spirit of cooperation. Many demand re-negotiation of the IWT, which they argue is the need of the hour (after working for 53 years) under changed circumstances. Still, considering the current realities, it is a remote possibility. It is hoped that wiser counsel will prevail to resolve water disputes in the larger interest of the teeming millions on either side. In order to harness the huge hydro potential of shared water courses in the Indus Basin, both countries shall have to learn from world history and rise to the occasion to consider joint designing and implementation of projects that take a holistic hydrological view and maintain environmental integrity of the basin without compromising developmental needs. * The award is a landmark for legal governance of shared trans-boundary water resources. * India's right to divert waters from the Kishenganga for power generation is protected by the 1960 Indus Waters Treaty. But it is under obligation to maintain the minimum flow to be released downstream from KHEP dam at 9 cumecs. * Argument by India regarding the use of the drawdown technique for flushing sediment accumulated in the reservoir has been rejected. It can be done only in the case of an emergency. * The dispute has raised important questions on the relevance of the Indus treaty; model of development by building large dams and reservoirs with environmental consequences; application of international environmental obligations; and adequacy of existing international courts to settle water disputes. The writers are Chairman of Centre for International Legal Studies at JNU, New Delhi; and Executive Director, Centre for Advanced Study on Courts & Tribunals, Amritsar, respectively. NEW DELHI: With an eye firmly on China, India and Japan on Monday decided to "further consolidate and strengthen their strategic and global partnership" in the defence arena through measures ranging from regular joint combat exercises and military exchanges to cooperation in anti-piracy, maritime security and counter-terrorism. This came during the meeting between defence minister A K Antony and his Japanese counterpart Itsunori Onodera, who is on a visit here till January 8. "The two ministers extensively and frankly exchanged ideas regarding regional and global security challenges, as well as bilateral defence cooperation and exchanges. They shared views on issues relating to the peace, stability and prosperity of the region," said an official. Onodera also briefed Antony on Japan's National Security Strategy and the National Defence Program Guidelines, which were adopted in December 2013. Both India and Japan have long been wary of the increasingly assertive behaviour of China, especially in the contentious South China Sea, as well as the rapid modernisation of the People's Liberation Army. The two ministers agreed to promote exchanges on UN Peacekeeping Operations between Japan Peacekeeping Training and Research Centre, Joint Staff College (JPC), Central Readiness Force of Japan Ground Self Defence Force (JGSDF) and Centre for UN Peacekeeping (CUNPK) of the Indian Army. The two sides will also conduct "expert exchanges" in counter-terrorism, humanitarian assistance/disaster relief between the Indian Army and Japan Ground Self Defence Force (JGSDF). The possibility of conducting staff talks between Japan Air Self-Defence Force and Indian Air Force as well as professional exchanges of test-pilots, flight safety experts and others is also on the cards. 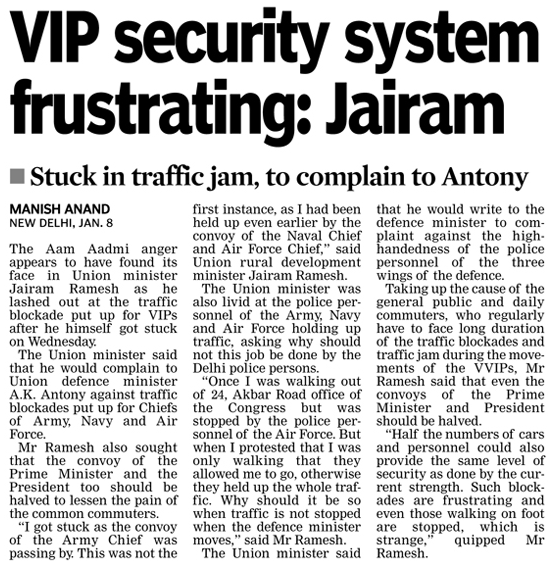 New Delhi: Irked over being held up in traffic by Army Chief's security, Union Minister Jairam Ramesh on Wednesday criticised the "ridiculous" VIP security system in the country, which according to him is "state within a state within a state" where there is no accountability. The Rural Development Minister said he would write to Defence Minister AK Antony, who doesn't keep a security ring around him, about the military police taking over Delhi Police's duty and clearing the routes for service chiefs when they move around the national capital. 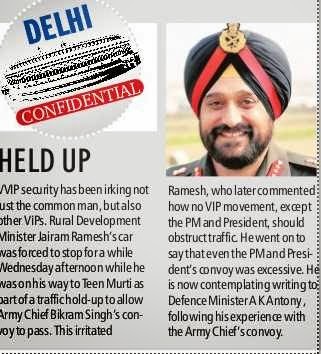 Ramesh, who never uses a red beacon on his vehicle, said his car was blocked near Army Chief's residence this afternoon by military police when he was going to Teen Murti to attend a meeting. "It is ridiculous... Mr Antony does not do this. There is no security to Antony at all. And they (Military) have their own policemen to regulate traffic. That is wrong. Delhi Police should regulate traffic... 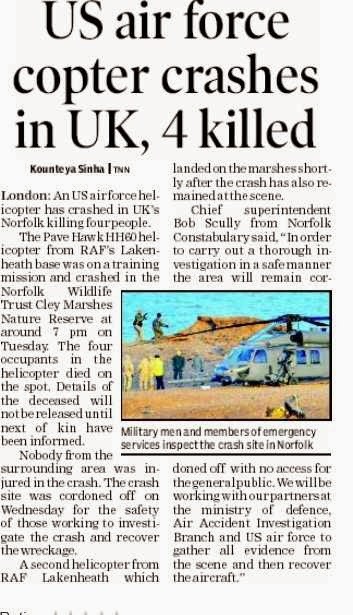 I am going to write about this to Antony," the Minister said. Ramesh said once he was blocked by military security in the city when he was walking to his home after work. "It was done for the smooth passage of the Army Chief's convoy," said the Minister who takes a 40-minute walk to his official residence in Lodhi Garden without security after work at the Rural Development Ministry office at Krishi Bhavan in New Delhi. 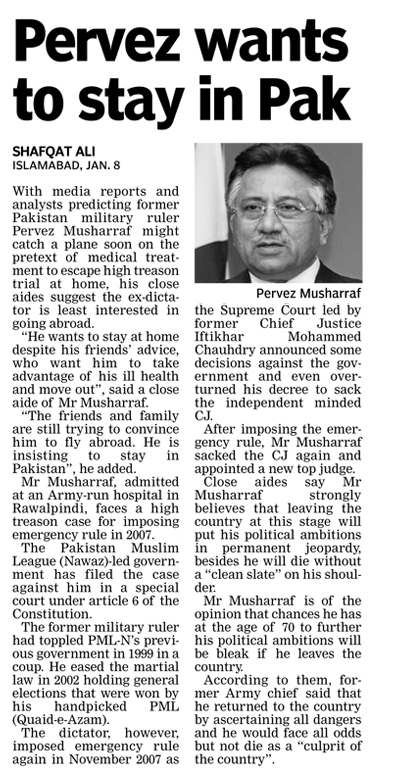 "Once I was caught up in traffic because of Army Chief. Once my traffic was held up because of the Naval chief. Once I was held up because of Air Force chief. Once I was held up because of Chief Justice of India," Ramesh said, criticising the VIP security system. Ramesh also criticised the way the traffic is being blocked for clearing the routes for convoy of the President and the Prime Minister. "Traffic should not be held for anybody. I feel even the traffic hold up for Prime Minister, and the President are far too long. I think the number of cars that accompany Prime Minister and President can easily be reduced by half. VIP security is state within a state within a state. No questions are asked. No accountability," the Minister said. Prime Minister Manmohan Singh today reviewed the situation on borders with Pakistan and China and operational preparedness of the Army and other two services at the Army Headquarters here. With the cancellation of the AgustaWestland VVIP helicopter deal and delays in acquiring the medium multi role combat aircraft (MMRCA) from Dassault, the Indian defense establishment is reeling under concerns that important projects maybe be further delayed. However, despite delays, India has reached major milestones with the indigenous supersonic fighter aircraft LCA-Tejas achieving its Initial Operation Clearance and the army taking delivery of its first indigenous helicopter, the Rudra ALH from HAL (Hindustan Aeronautics Ltd) in 2013. According to Defenseworld.net research report on Indian procurement, the Indian air force leads with $31.3 billion in procurements in the past five years, followed by the navy with $7.5 billion and the Army with $4.2 billion. The air force’s successful procurement list includes C-17 Globemaster III, P-8I long-range maritime surveillance aircraft, Boeing Chinook helicopters, Russian Mi-17 V5 helicopters and Israeli drones. In contrast, the army leads with the most number of indigenous procurements while the airforce has the least.